Jim surprised me with this pie in progress when I came home from my work-out this afternoon. The result is not as firm as he would would like, so he plans to make another – I won’t complain. The revised and final version is very similar in ingredients, but the instructions and type of chocolate used are key to the recipe success. Preheat oven to 450 degrees-F. Roll single pie crust to 12-inch in diameter, place in 9-inch metal pie pan, and crimp edges. Pierce pie crust 20 to 30 times with a fork. Bake for 15 to 18 minutes or until crust is light brown. Remove from oven and let cool to room temperature. Chop cholocate into small pieces. Combine chocolate, 1/2 cup sugar, flour, and milk in a medium pot. Heat over medium heat and stir constantly until chocolate melts and mixture begins to bubble and thicken. Continue stirring for 5 minutes. In a small bowl, combine remaining 1/4 cup sugar and egg yolks. Temper the yolks by adding 1/4 cup of the hot chocolate mixture to the eggs and sugar and whisk. Pour tempered yolk mixture into the chocolate mixture in the pot on the stove. Stir continuously and continue heating over medium heat for 2 minutes. Pour warm chocolate pie filling into the baked pie crust. Chill in the refrigerator overnight. 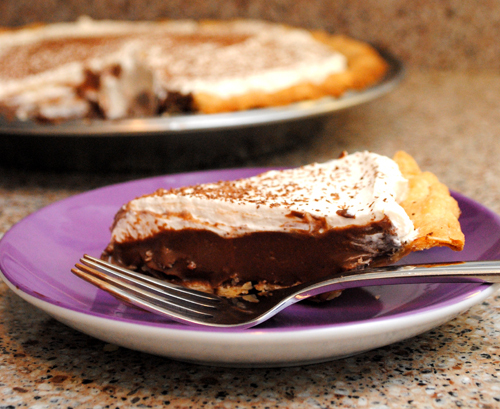 Top chilled pie with Whipped Cream and chocolate shavings.